Thanks to the colder weather we've been having lately in this part of Texas (and which I am loving) I've been able to wear boots and scarves more. Several times over the last week my go-to item for a quick bit of pizazz has been a scarf. They add color or pattern, draw attention upwards and provide warmth. I tend to choose lighter weight, gauzy scarves because I don't want to be too warm, especially indoors. 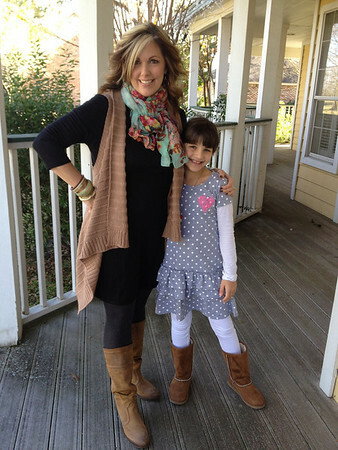 My sweet girlie popped in for a photo too, her outfit is all from Old Navy. There you have it, short and sweet this week. Thanks! I don't know if drapey vests or sweaters are still *in*--I hope so because I'm still hooked on them. Hurrah! Another runner! I haven't done a marathon since I had my son (have only done one), but have a fit in a couple of half marathons. I like your outfit--pretty. I do that type of idea a lot...basics with pops of color in accessories & top layer. It's always fun to *meet* a fellow runner! :) I'm not running a whole lot lately, but trying to get back into it. Thank you! I'm finally learning that it's better (at least for me) to have basics and mix and match. Adorable outfit! Love the layering and that scarf. So pretty! Thank you! Our weather is so flaky between hot and cold, often on the same day, so light layers really help.